This course is aimed at teaching healthcare coordinators and providers about improving outcomes through best practices and effective cost strategies in caring for adults with asthma and chronic obstructive pulmonary disease (COPD). Asthma and COPD are included in chronic lower respiratory disease which is the third leading cause of death in the United States (CDC, 2015). This means that chronic lower respiratory diseases are among the costliest diseases to manage and treat. While asthma and COPD are among the leading increases in healthcare costs, there are steps that can be taken to help make their healthcare more cost effective. 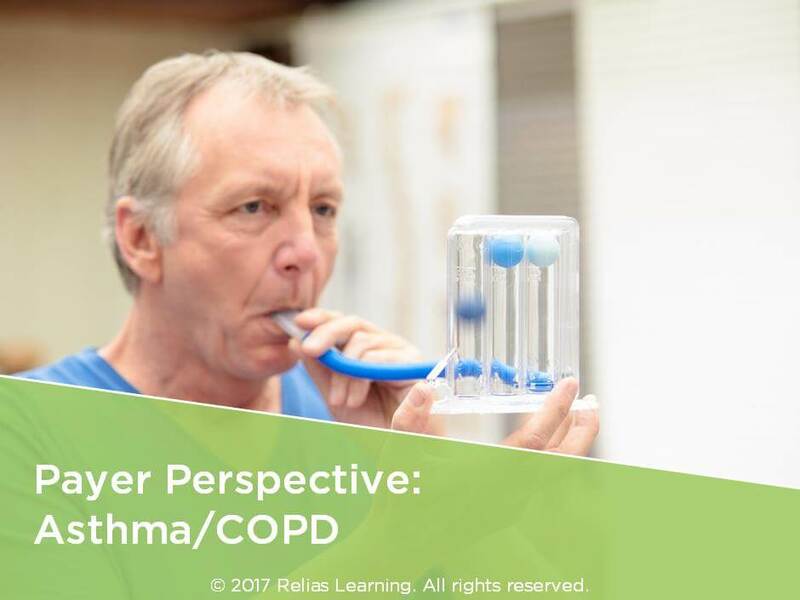 Although this course links asthma and COPD, the COPD discussion is targeted at earlier stage recognition and treatment with the hope of minimizing the progression of the disease. If COPD progresses, additional medications, delivery systems, and concentrated oxygen may need to be added. That is beyond the scope of this discussion. •	Indicate best practices for providing asthma and chronic obstructive pulmonary disease (COPD) care while achieving cost effectiveness. •	Identify different educational tools for teaching self-management to patients with asthma and COPD. •	Cite the appropriate annual testing for asthma and COPD. •	Write an asthma and/or COPD action plan with your patients. •	Identify how to provide nutritional counseling for patients with asthma. •	Identify potential social determinants of health that could impact adherence to the action plan. Alisa Brewer, BSN, RN, has worked in ambulatory care, acute care, and occupational health with her most recent position as clinical coordinator in primary care. As clinical coordinator, she was responsible for quality improvement, care coordination and education, clinical staff training and compliance, and overall safety of the clinic. She also participated in patient-centered medical home (PCMH) and other healthcare improvement initiatives. Additionally, she has experience in hospital-affiliated urgent care where she provided patient care utilizing quality improvement measures, served as nurse preceptor, and nurse IT liaison. Alisa currently works at Relias Learning where she serves as content writer and subject matter expert for various healthcare topics. Disclosure: Alisa Brewer, BSN, RN has declared that no conflict of interest, Relevant Financial Relationship or Relevant Non-Financial Relationship exists. Dr. Oestreich provides key strategic consulting on Medicaid issues including health information technology, decision support, program design, pharmacy practice, pharmacology, and care coordination policy development. A major interest is developing transparent integrated patient care management and coordination solutions into current practice. He has unique and comprehensive experience in all areas of pharmacy practice including public health clinics, community practice, institutional practice, public funded pharmacy programs, 340B discounted drug, and pharmacy benefit design. Dr. Oestreich has been engaged in teaching and accreditation of pharmaceutical education for many years including serving as a preceptor for pharmacy students and pharmaceutical education accreditation. Dr. Oestreich earned his BS in Pharmacy from the University of Missouri-KC, his Master of Public Administration from University of Missouri-Columbia, and his Doctor of Pharmacy from Kansas University. He served on the Missouri Board of Pharmacy for 5years, and as President for 2 of those years. Disclosure: George L. Oestreich, Pharm.D., MPA has declared that no conflict of interest, Relevant Financial Relationship or Relevant Non-Financial Relationship exists. The target audience for this course is: Case Managers; Nurses; Physician Assistants; Physicians; in the following settings: All Healthcare Settings.